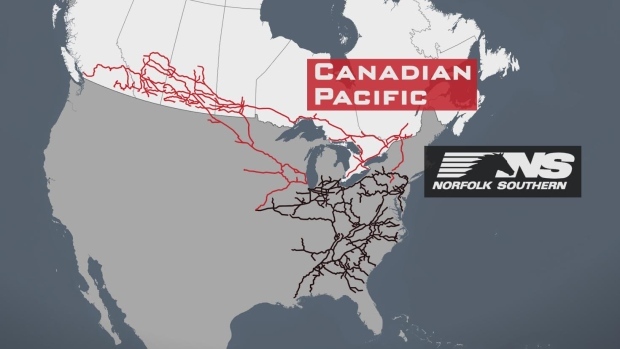 Canadian Pacific (CP) CEO Hunter Harrison has faced a wall of opposition ever since announcing his intention to merge his company with Norfolk Southern (NS) last November. And that wall includes NS itself. On Dec. 7th, NS released a “white paper” that outlined the various reasons why a merger would be unwise, including the viability and profitability of a merger as well as its ability to stand up to federal scrutiny. The report was written by two former members of the Surface Transportation Board (STB) – the very agency tasked with approving a merger based how it would serve the public interest. For union members working on NS, the impact is fairly certain: a merger between the two companies would be devastating. Some market analysts believe as much as a third of NS workers could lose their jobs from “synergies” and an adoption of CP’s notoriously bare-bones business model. Another major concern is over what subsequently might happen should the merger succeed. “Assuming the merger goes through, the remaining Class 1’s will have litte choice but to combine,” says Railway Age Editor-in-Chief William Vantuono. He beleives some sensible mergers to follow might include Union Pacific with CSX, and Canadian National (CN) with Burlington Northern Santa Fe (BNSF). These resulting mergers themselves would mean even more jobs lost with estimates in the tens of thousands. “…At face value, Harrison and Ackman are offering Norfolk Southern investors a terrible deal. Fortunately, labor isn’t alone in this fight. Shippers, manufacturers, utilities, and others have written to the STB about their deep reservations in how a merger would negatively impact commerce, reduce jobs and wages, and potentially put workers and the general public in danger. In the last month alone, the uphill battle CP is facing has only gotten steeper as more and more interested parties have come out opposed. For our part, TCU sent a letter of opposition last week to the STB. SMART Transportation Division followed suit earlier this week. UPDATE (1/19/16): Since posting this blog, the head of the Federal Railroad Administration (FRA) told the Wall Street Journal that the agency has concerns associated with combining CP and NS. And while the FRA doesn’t have the authority to block a merger, its voice could carry weight with the members of the STB – especially with those that recall the tragedies that followed the Union Pacific and Southern Pacific merger in the late 90s. “…a member of the Surface Transportation Board, Deb Miller, said in an interview that the agency’s mandate includes ensuring any merger is in the public interest and that it promotes competition. “Without question, safety is very likely to come up, but it’s going to come up under that broader question of public interest,” she said. Federal safety officials have zeroed in on mergers before when searching for the cause of safety lapses at major freights. The National Transportation Safety Board held a special hearing in 1998 into Union Pacific, after a series of accidents that killed workers and some members of the public following its merger with Southern Pacific the year before. The agency criticized Union Pacific management at the time for insufficient procedures governing employee workload and train dispatching.